"The elite of the regiment", is often a phrase used to describe the British Grenadier. Like their Light Infantry brothers, the Grenadier represented a unique type of soldier in the ranks of the infantry. Originally selected as specialized assault troops for seiges, Grenadiers quickly gained the reputation of being courageous, fearsome soldiers. By the opening of the 18th century, they were usually the elite of any army in Europe. These men where the elite of the regiment. 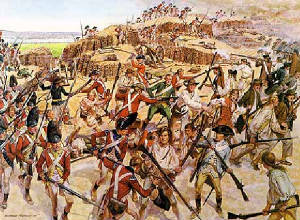 The Grenadiers original role on the battlefield was not only unique but held a distinguished place for them in the army structure. As this role evolved into the late 18th century, the Grenadiers came increasingly to resemble their brothers in the Light Infantry, making the Grenadier less a grenade-throwing and seige specialist. He was more often called on to perform special tactical functions on the battlefield. The original role of a Grenadier was as assault trooper. He was primarily a soldier who could be counted on to throw grenades and storm breaches in the seiges that marked every campaign in the daysn between Turenne and Marlborough. The earliest references to these grenade-throwing soldiers are from Austria and Spain. Even the word grenade has a Spanish origin in the word Granado which simply means pomegranate in a description of the general size of early grenades. As well, references appear in England during the English Civil War. However, the great King Louis XIV, of France finalized the concept of the Grenadier as an official type of soldier and company throughout his army reforms late in the 17th century. According to Rene Chartrand, Lt. Col. Martinet (from where we get the term martinet) introduced the idea of having men detailed to throw grenades in the Regiment du Roi in 1667. By 1670, 29 of Louis's regiments had Grenadier companies. Shortly after France's lead almost all of Europe went Grenadier crazy. By 1677 the British army had them. The 1st foot guards had a company and there was even a mounted Grenadier company in the army. In it's purest form the grenade as a weapon was a grapefruit or "pomegranate" sized cast iron ball filled with powder explosive and metal stones as shrapnel. A time fuse was attached and as the grenade was thrown into the close packed ranks of the enemy or a breach, the explosion could do significant damage. As one can see this was a truly specialized role that no doubt required specific skill and training to perform. There is much speculation regarding the inefficiency of the grenade as a weapon. A common belief is that the reason for the weapon's eventual fall from favour was its tendency to explode before being thrown. However, very little contemporary evidence exists to support this. In the 1727 "Grenadier exercise" it is loosely explained : "When the Granadiers stand in a body with men of the Battalion they must then perform the same motions that they do because they do not then meddle with their Granades". A more plausible explanation for the grenade's fall is due to an overall increase of firepower in the 18th century army. In fact as late as 1779 in Roger Stevenson's partisan military manual "Military Instructions for Officers Detached in the Field" he reccomends grenades for both the defence and assault of fortified posts. The 17th century Grenadier was a true grenade throwing type of soldier. The Grenadiers early rise in popularity was no doubt due to the usefulness of this weapon given the common specifics and frequent occurence of seiges in the late 17th century. Louis XIV, the famous "Sun King," was a man that was used to getting his way. He was a man who not only loved war but also had a taste for sieges. This was the great age of the Vauban fortress, which amounted to a fair number of mathematical siege works. Siege works required specialty trained assault troops, a role the Grenadiers fit perfectly. Considering the rapid rise in the Grenadiers popularity throughout the late 17th century it would be safe to suppose their usefulness was beyond mere fad, especially given the particularly structured nature of war in this period. Therefore the idea that Grenadiers were causing too much friendly fire is a more a myth than truth. Indeed the decline of grenade usage into the 18th century can be attributed to the overall improved effectiveness of massive infantry line tactics and firelock technology. So why did Grenadier as a troop type continue when the grenade became obsolete? As the age of reason dawned the need for grenade throwers disappeared but the need for assault troops did not. The Grenadier naturally evolved into this role and kept the elite prestige that they had garnered throughout their early life. The fair number of siege assault actions in the 17th century no doubt quickly added to the Grenadiers' fearsome reputation and prestige. As they were also specially selected and trained the attention also created a spirit of esprit de corps among them. Indeed throughout time the Grenadiers had special privileges such as guarding the Colonel or the King himself. The Grenadiers also developed special uniforms, equipment and requirements as they evolved. In the early days, carrying around of bag of heavy cast iron grenades, as well as your regular armament must have been fairly tough. This is why initially only the largest of men were chosen for the job. One had to be strong to throw the grenade. At first the Grenadier's of Louis's army were uniformed in the regular standard infantry uniform. They were issued the newer flintlock fuzils rather than matchlock muskets and also issued swords. In fact the reason later military muskets for infantry were fixed with slings is because the original Grenadier fuzils were the first to be fixed with slings so they could throw their grenades. By 1676 we see special fur lined tuque like hats being worn, obviously a practical change as the wide brimmed hat must have gotten in the way of slinging muskets and throwing grenades. These hats were also an early version of the cloth mitre and eventually the tall bearskin hat. It is interesting to note that the first bear skin Grenadier hats appear in France during the 1740's and if you follow styles, those nations who were Protestant, such as Hanover, and Britain wore the mitre while Catholic countries such as Austria and France wore bearskins. The early Grenadier also originally carried a long curved sword. This sword continued to be an emblem of Grenadier companies even when regular infantry companies dropped swords as a part of their equipment during the mid to late 18th century. Indeed the French Grenadiers of the 1690's carried both sword and an axe no doubt for the utility of hacking down fortified defenses during assault. 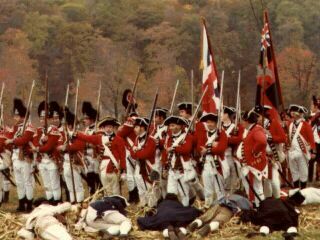 The first British Grenadiers were not issued swords but instead had axes. Eventually the axe was phased out and they adopted heavy swords such as basket hilted cavalry swords. 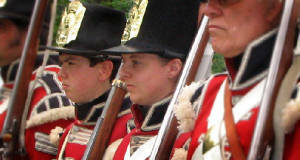 Grenadiers continued in popularity during the continental wars of the middle 18th century. As mentioned before there were even whole single regiments and battalions created solely out of Grenadiers. The Grenadiers de France, (active in the 7-year's war) were formed from the Grenadier companies of several regiments that were reduced at the end of the war of the Austrian succession. This formation was eventually disbanded after the 7 years war ended. Frederick the Great created "standing Grenadier battalions" from the Grenadier companies of his garrison regiments. Unlike the other Grenadier Battalions that only came together for a campaign, they stayed together all the time. The Austrians did something similar after the 7 years war by permanently embodying their Grenadier battalions and even giving them colours. The curious thing is that men still came from their respective regiments, and still wore their regimental uniform. So, while they were a permanent battalion they always wore different uniforms.